The hairdresser chuckled at the thought. I smiled and mentioned Mount Bromo, but not before admitting my excitement about the spicy cuisine. 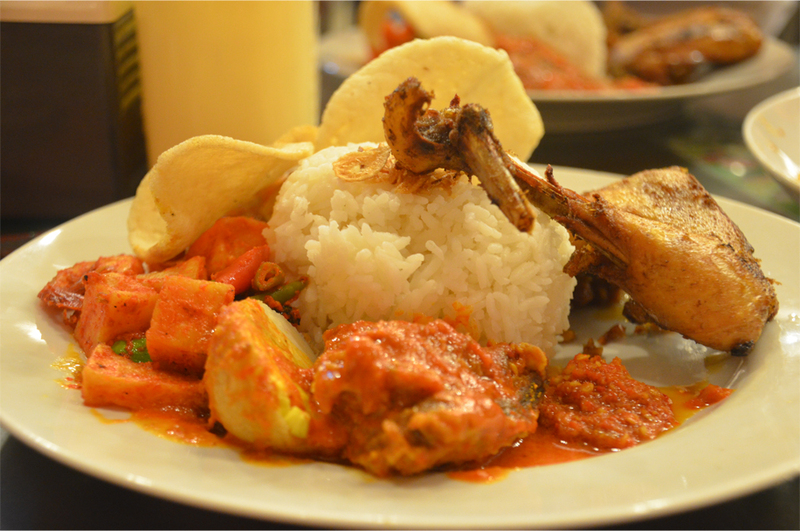 Nasi – rice – was perhaps the first word I learned in Bahasa Indonesia. This was followed by ayam and sapi – chicken and beef, cumi (squid), udang (shrimp), timun (cucumber) and eventually, terong (eggplant). Months ahead of the trip, Bama had told me about sambal, traditional chilli sauce with an untold number of variations. I learn (albeit the hard way) that a tall glass of es kelapa – coconut water, with slivers of the fruit and shaved ice – is the perfect antidote for a mouth on fire. Then there’s jus alpukat, avocado juice paired with condensed milk, a smooth and subtle blend with a dash of chocolate syrup. Bama introduces me to sate ayam Blora, tender chicken skewers in a fragrant peanut sauce with sambal, a recipe from a town in Central Java. Tahu telor, native to Semarang, is one of my favourite Indonesian dishes. 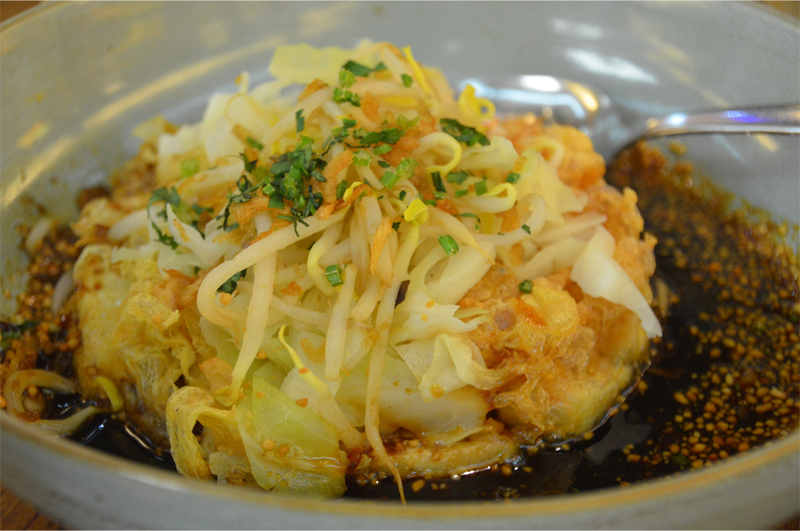 I would describe it as a crispy tofu omelette, with a topping of beansprouts, shredded cabbage and chopped scallion, all served in a liberal helping of sweet soy sauce – kecap manis – and peanuts. Before the six-hour journey to Bromo, we fill up on nasi uduk for breakfast, a bargain at only 7,000 rupiah (less than one US dollar). Over a bed of white rice, it’s an assortment of chilli egg, peanut sambal bihun (rice vermicelli), and tempe bacem – fermented soybean braised in kecap manis. For those with a sweet tooth, Yogyakarta specialty nasi gudeg features young jackfruit, slow-cooked in coconut milk and sprinkled with shreds of fried garlic. The one I tried also had tofu, egg, spicy krecek (beef skin) and tender pieces of chicken in coconut milk. Javanese dish nasi rames is a feast in itself – it includes spicy tofu, crispy fried chicken, sambal goreng (chilli potato), chunks of beef, krecek, and slivers of tempe cooked in kecap manis, rounded off with Indonesia’s ubiquitous shrimp crackers – kerupuk udang. It all looks delicious! Fortunately in Australia we get great Indonesian food, possibly not as good as the real thing, but not bad. Here in Italy it is very difficult to find anything but Italian. It was fabulous, Debra – I don’t think the photos even do them justice! It was such a pleasure to take you to try the real thing, James! 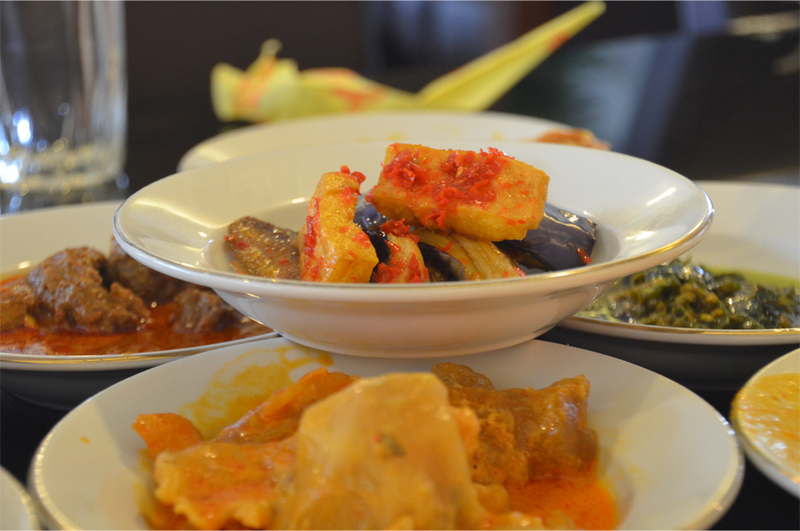 But those are only the introduction to the wide selection of Indonesian dishes, from Aceh to Papua. I’ll make sure you try more the next time you come! Thanks Bama, I loved tasting all those different dishes! 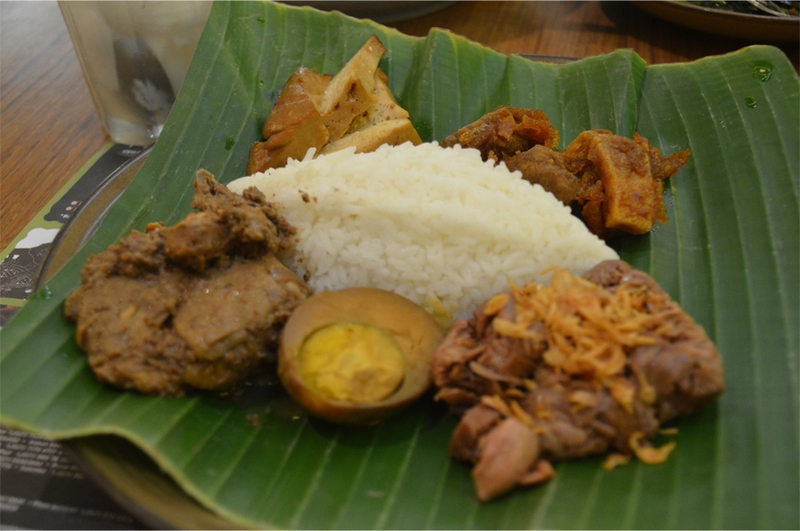 I’m really looking forward to coming back in December – will be interesting to compare Sundanese food with the Javanese ones I’ve had so far! Now I’m hungry! Great post, thanks for sharing. My wife was able to travel to Bali in 1998 and she absolutely loved it. She spent 3 weeks there with friends and by the time she returned she was speaking some Balinese and had travelled all over the island. Glad you enjoyed it! Indonesian food seems to be very underrated – out of all the Southeast Asian cuisines, Thai gets the most attention by far. Your wife is very lucky, 3 weeks in Bali would be an absolute dream! I haven’t made it there yet, but I’m planning to go within the next two years. 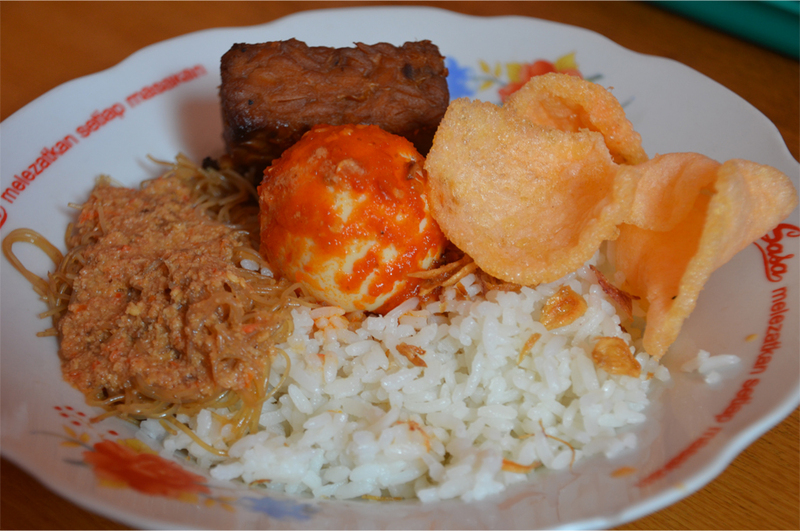 I miss paying a couple of dollars for an amazing Indonesian meal. A restaurant not far from us charges $13 for Nasi Goreng, and while it’s pretty good, I couldn’t get the overpriced taste out of my mouth. I’m finding the same problem in Hong Kong – there are a couple of good Indonesian restaurants but the prices are often exorbitant in comparison. Still, $13 Canadian for a Nasi Goreng is just ridiculous! Your post has me excited to be heading back to Indonesia for only the second time next April. This time I will def be asking for the Tahu Telor, looks delish! Like the food pics….tantalizing!!! I think I could have easily ordered another Tahu Telor, it was that good! This food looks stunningly delicious! I’ve heard that Indonesian food is some of the best in the world. Now you are making me so hungry! And it looks very healthy and fresh unlike what we normally get here in the US. Oh, it really was Nicole! I’m not surprised about that claim – there are just so many flavours and spices in each dish! I think you would love the variety and also the sheer number of tropical fruits. Food and Food haha.. Do you like it? Of course Danny, I loved it! it all looked pretty delicious! hope you enjoyed every dish! mmmh, still have my mouth water at the very thought! I think you would love it, Madhu! Even here in Hong Kong I find myself missing the rich flavours and spices of Indonesia. I had to train myself for the spiciness weeks in advance (with a bottle of sambal), but the effort paid off and Bama was very much surprised. You should have seen him laugh when I broke out into a sweat over Lao food! All the dishes seem delicious!! Makasih Yuna, sorry for not getting back to your comment till now! 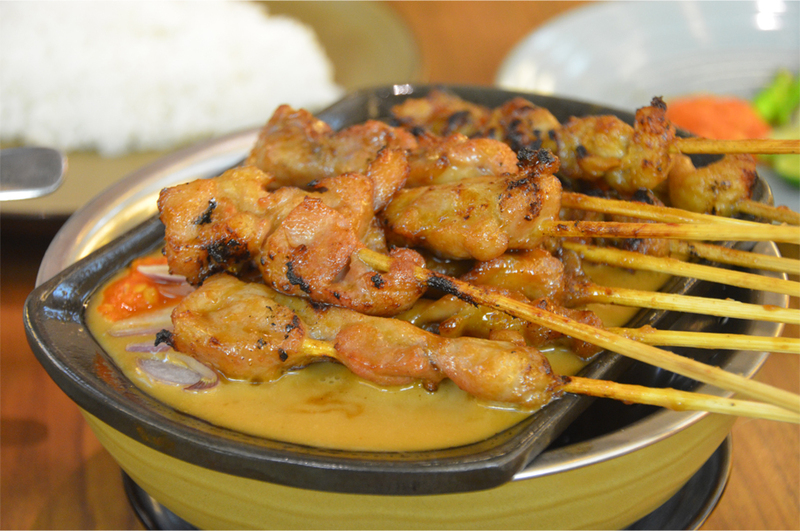 Ha, I did have it at one of the best places in town – Sate Khas Senayan! Indeed, Sate Khas Senayan is a good place. 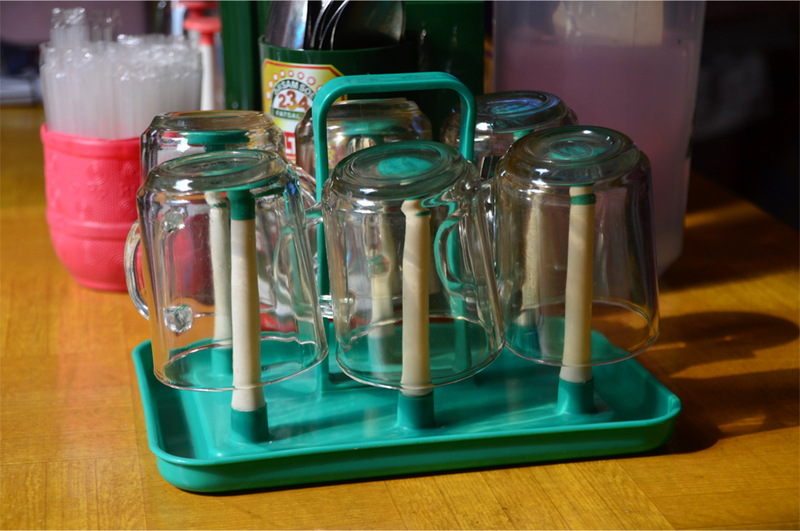 Glad to know that u like Indonesian food and Sate Senayan is the easiest place to taste some of the food… Come back and enjoy some more food …. Yes Lina, I can’t get enough makanan Indonesia – so much flavour and wonderful spices! I’ll be back in about a month, this time in Bali. Enggak sabar ya!